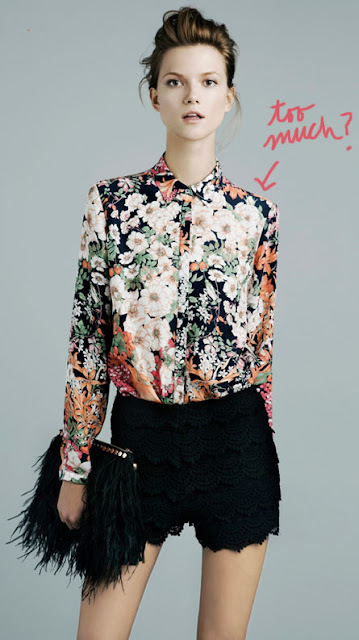 I tried on this floral blouse at Zara when I was in New York last week and couldn't decide whether it was cute or crazy. Yes, it's super trendy (blooms will be big again this spring), and most likely I will wear it only a couple of times--justifiable at $49--but it's also undeniably fun and bright. What do you think? Well, if you would ask me, i think you could easily wear this with a black pencil skirt, black tights and lace up shoes ? Not too much at all! I absolutely love it and after I posted it on my blog I went to check it out in person. I think the print is perfect, but I was a little turned off by the feel of the polyester. I know, at that price what did I expect, but still, it just felt a little to plastic-y to me.